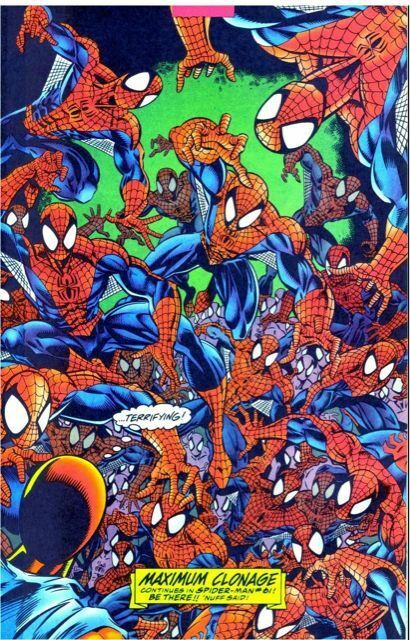 Rules: Clone Saga, golden, only 1 character. I’m thinking of Blink, but who knows. So the format is BYOS which is a big deal. Out of all formats for VS, BYOS is one of the more fair and most random. There is a flaw in almost every set, some bigger than others. But when you look at each and every set, you usually turn to the usual formula of search, attack and KO, and you also add mid to end game into the equation. There are a some possible weenie rush decks, but since most of the dangeroous cards are not in one set, there isn’t too much to worry about. Team threats: every team, from Family of 4, to MKKO, 198, or X-Men pure, Brotherhood pure. Not a weak team in sight. I’ll update thoughout the week to get you up to speed on evrything and also pros and cons of the boxes. Clone Saga or Episode V(s) ATK of the CLONES!!!! Characters are not unique, hence the clone theme…..SWEET! Vs has out done itself again, cause I would love some more BYOT action, but this will do even better. Iron Man– It can happen, I would not recommend it, but you have 3,4, a killer 5, use the Illuminati 5 with a shield agent on 6, iron man on 7. Hulk busters and Extremis Upgrade, Undisclosed location, Iron man is a fighter! Superman / Batman -We know about the worlds finest deck, but you don’t have to sub out 3 drop batman for Barbara Gordon, or you can wait for a better time to best of the best on higher drops. Captain America: Its cap, rally, the shield, charging star, final justice, you know the drill people. Darkseid: More dangerous, because now thats about 3 or 4 cards not needed to make him not unique. Human Torch– One of the most difficult ones, esp. with the ultimate version just coming out. It can be done, a lot of stunning, and decreasing, plus the rest of the fan 4 family will help. Clobbering times, torch and thing, you know. Mr.fantastic– Same as torch, but with more search, better defense, real fun to work with, esp. with inhumans. Invisible woman– Either inhumans, or fan 4 fun, but with probably the most defense of a clone Fan 4 deck. Wolverine– X-Men assembles, 3,4,5, 6 [use him for discard food] 7, attack, recover, attack again. Simple, plain, hard and painful! Juggernaut– Unstable grounds + equips means you will stay on curve, with the brotherhood attack cards, or even team them up with X-Men for more damage. Punisher– Really dangerous in this format. He can sniper shot on each drop after 4, then double equip the 4 drop [the only visible character] so everyone else dies. No fan 4 required, even though extra search is good. It is ongoing, so if you have a idea, let me know and we’ll looking into it. Damocles Base – Free characters, no downside. The Captain – Can’t Remember His Real Name – A nice 7/6 sub for whatever character you have. Carrying the torch – Any other name characters can gain them. Uncertain Legacy-Free search, better than mobilze.